Well known by name, Interstate 495 along the Capital Beltway encircles the Washington, D.C. metropolitan area. A heavily traveled commuter route, I-495 connects a number of suburban communities across both Northern Virginia, Montgomery County and Prince Georges County, Maryland. The beltway also passes by several government sites including Join Base Andrews, NASA Goddard Space Flight Center and the U.S. Food and Drug Administration among others. Interstate 495 serves regional traffic with several routes radiating outward from the Capital Beltway and D.C. area. They include I-66 west to Front Royal, I-95 south to Richmond, U.S. 50 east to the Chesapeake Bay Bridge, I-95 and Baltimore-Washington Parkway north to Baltimore and I-270 west to Frederick. 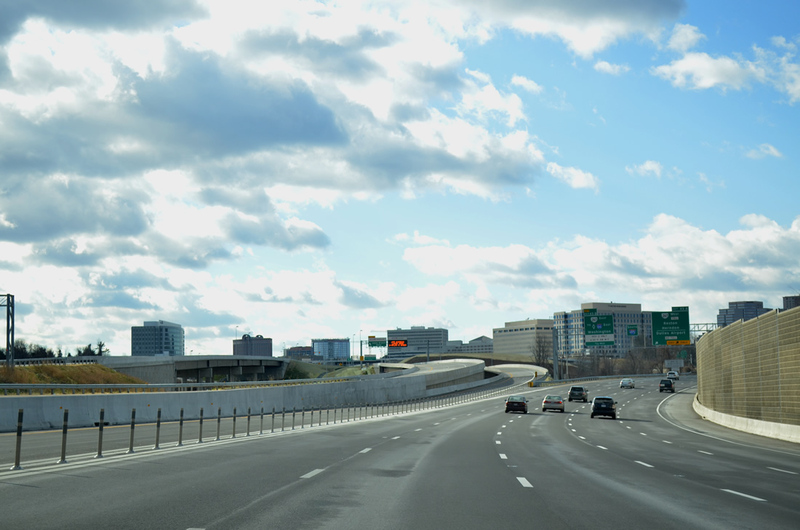 Express toll lanes accompany the I-495 leg of the Capital Beltway north from Springfield to Tysons Corner. Interchanges along the Capital Beltway were renumbered in 2000 with exits counting upwards from the Woodrow Wilson Bridge counterclockwise to Springfield. Exits along I-95/495 between the Springfield Interchange and Woodrow Wilson Bridge continue the numbering system for Interstate 95 from the Virginia state line. When Interstate 95 was deleted from within the beltway in 1977, that designation wholly replaced I-495 on the eastern half of the beltway. This was formally approved by AASHTO on November 15, 1975. However in 1989, the Interstate 495 designation was restored along the eastern beltway to provide a consistent number for its entire length. AASHTO affirmed this at the route numbering committee meeting on June 10, 1991. As a result of this action by AASHTO, the eastern half of the Capital Beltway is signed as both I-95 and I-495. The FHWA Interstate Route Log and Finder list attributes the overlapped mileage soley to Interstate 95. Built in 1961, the Woodrow Wilson Bridge spanning the Potomac River was the only bridge in the Interstate Highway System maintained by the Federal Highway Administration. The draw bridge between Alexandria, Virginia and Oxon Hill, Maryland was replaced by a massive construction project underway from May 2001 to 2009. Work included the demolition of the original bridges, construction of new spans at a height 20 feet above their predecessors and interchange upgrades on both sides of the river. Operated by state agencies for Maryland and Virginia and the District of Columbia, the new Woodrow Wilson Bridge carries four roadways in a local and express configuration with a 70 foot draw span. Express/local roadways lead east beyond Maryland 210 (Indian Head Highway) and west to Telegraph Road. Work at area interchanges continued through early 2013 at Telegraph Road in Virginia. Major work broke ground in 2008 on Interstate 495 between Springfield and McLean, Virginia. Costing $2 billion and funded by private companies Transurban and Fleur,2 the 495 Express Lanes project rebuilt the Capital Beltway with High Occupancy Toll (HO/T) lanes added between the north and south roadways. Extending 14 miles north from the Springfield Interchange with I-95/395 to a point south of SR 193 at McLean, the 495 Express Lanes opened to traffic on November 17, 2012. The 495 Express Lanes accommodate two lanes per direction with ramps independent of the I-495 general travel lanes. All electronic toll (AET) gantries collect tolls with E-ZPass and other interoperable transponders. Congestion pricing adjusts toll rates based upon the time of day and traffic congestion. HOV-3 eligible motorists with an E-ZPass Flex transponder can use the Express Lanes free of charge. Source: Maryland Department of Transportation (MDOT) 2017 Traffic Volumes Maps by County. Former overhead signs for I-395 and I-95 north on Interstate 495 east. The merge with Interstate 95 northbound was numbered Exit 4A in the old sequential numbering system. Vidcap taken 05/27/95. The 495 Express Lanes separate from I-495 southbound just ahead of the exchange with Virginia 267 (Dulles Access Road). Photo taken December 30, 2012. Interstates 95 north & 495 west, one half mile before their split. Three lanes continue I-95 north toward Baltmore while I-495 maintains eight overall lanes through the exchange. Even with this many lanes, traffic delays are frequent. Photo taken by Jim K. Georges (07/99). More photos showing the I-95 north and I-495 west split posted on the guide Interstate 95 & 495 North – Capital Beltway Outer Loop. Cherry Hill Road passes over Interstate 95 south as the freeway prepares to separate into ramps for the Capital Beltway. The southbound mainline merges onto the left side of I-495 east, beyond the adjacent interchange with U.S. 1 at College Park. Photo taken 08/04/13. Two lanes depart for I-95 & 495 south to Greenbelt, Glenarden and Oxon Hill on the east side of Washington, DC. Two lanes also continue to I-495 west to Silver Spring, Bethesda and the American Legion Memorial Bridge into Northern Virginia. Photo taken 08/04/13. Following the ramp for I-495 west, traffic again splits with a single lane continuing south to a weigh station, carpool lot, and an return ramp to the Capital Beltway inner loop ahead of U.S. 1 at College Park. 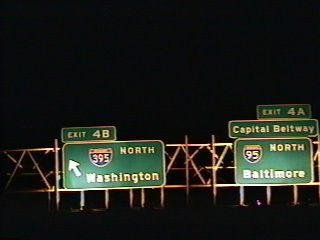 The left exit utilizes the I-95 stub constructed for the canceled route through Washington. Photo taken 08/04/13. Additional photos showing I-95 south leading into the Capital Beltway posted at Interstate 95 South – Howard County to Capital Beltway. Interstate 495 east enters the directional cloverleaf interchange (Exit 27) with I-95 north. Photo taken 12/21/12. All trucks are directed to Exit 27 when the weigh station at the south end of the I-95 stub is in operation. The ramp departs from the right also to an adjacent carpool lot. Photo taken 12/21/12. Full coverage of I-495 east at I-95 posted at Interstate 495 / Capital Beltway – Inner Loop. Two lanes join the Capital Beltway outer loop as the continuation of Interstate 95 north onto I-495 east. The freeway mainline stays to the outside for I-395 (Exit 170A) and I-495 north / inner loop (Exit 170B). Photo taken 12/16/16. An ingress point to the 395 Express Lanes north to Arlington separate from I-95 just ahead of the separation with ramps for I-495 north to Tysons Corner and I-95/495 east to the Woodrow Wilson Bridge. Photo taken 12/16/16. The Henry G. Shirley Memorial Highway transitions from Interstate 95 north to Interstate 395 as Exit 170A while a flyover (Exit 170B) departs for Interstate 495 north to Tysons Corner. I-495 partitions with the Express Lanes just west of the Springfield Interchange. Photo taken 12/16/16. Full coverage of I-95 north through the Springfield Interchange posted at Interstate 95 North – Fairfax County. Exit 57A departs from I-495 east for a collector distributor roadway south through the nearby exchange with SSR 644 (Franconia Road). Two lanes follow from the Capital Beltway eastbound for I-395 north at Exit 57B. Photo taken 12/16/16. Complete coverage of I-495 east leading into the Springfield Interchange found at Interstate 495 / Capital Beltway – Outer Loop on AARoads. Photos showing Interstate 495 before construction of the Express Lanes posted at Capital Beltway Outer Loop – Archive page. Interstate 95 south leaves the Capital Beltway along a two lane flyover toward Franconia, Fredericksburg and Richmond while I-495 continues west to I-395 north into Arlington. Photo taken 08/04/13. A second left side ramp joins the Capital Beltway inner loop with the I-95 Express Lanes south to Stafford and I-395 Express Lanes north through Alexandria. The I-495 Express Lanes commence westbound just beyond the Springfield Interchange. Photo taken 08/04/13. Additional photos showing the Capital Beltway west at the Springfield Interchange posted at Interstates 95 & 495 South – Capital Beltway – Inner Loop. “Here come the Beltway HOT Lanes — you ready?” The Washington Post, November 16, 2012.